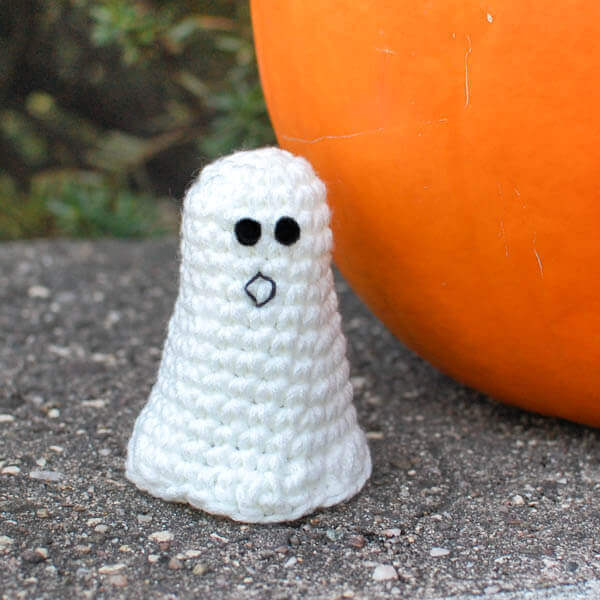 This adorable ghost crochet pattern is perfect for your Halloween decor or for adding to little treat bags! 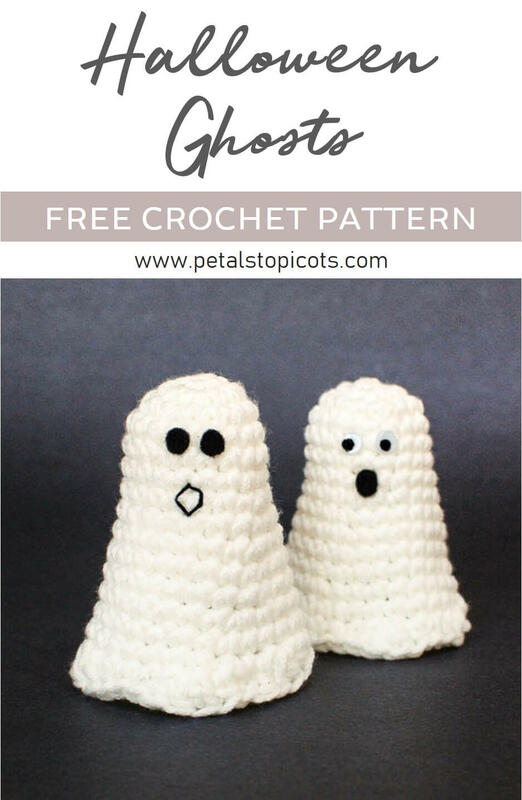 And if you do “ghosting” or “booing” in your town, I’ve also included a fun ghosting printable you can use on your packages. Don’t know what that means? Keeping reading and I’ll fill you in. You might even want to start the tradition in your neighborhood! What Is “Ghosting” or “Booing”? I had never heard of “ghosting” until we moved to our town a few years ago. One night our doorbell rang and we opened the door to find a bag of candy and a cute little note telling us we had been “boo”ed. My kids were ready to dig right in to that bag of candy, but I was feeling a bit wary and called our neighbor to see if she knew anything about it. She laughed and filled me in on this fun tradition. 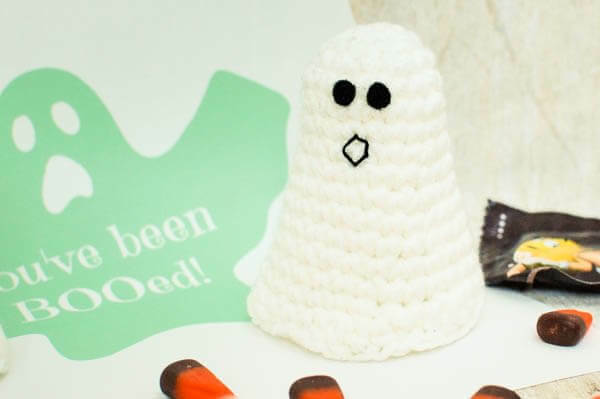 Basically, “booing” is when you leave a Halloween treat on a friend’s or neighbor’s doorstep with a note. They then in turn do the same and pretty soon, everyone is “booing” each other. It really is quite fun. Now it is my kids’ favorite part of Halloween … they like it even more than trick or treating! There are even some neat poems and sayings I have seen, but we just print out or own little ghosting printable. Scroll to the bottom of the post to download it and try it out with your neighbors. Notes: Rounds 1 through 14 of the ghosts are worked in unjoined rounds. Move stitch marker up after each round to help keep track. Round 1: Ch 1 (does not count as st here and throughout), work 6 sc in ring — 6 sts. Round 3: Work *2 sc in next, 1 sc in next, rep from * around — 18 sts. Rounds 4 through 7: Work 1 sc in each st around — 18 sts. Round 8: Work *2 sc in next st, 1 sc in each of the next 5 sts, rep from * around — 21 sts. Round 9: Work 1 sc in each st around — 21 sts. Round 10: Work *2 sc in next st, 1 sc in each of the next 6 sts, rep from * around — 24 sts. Rounds 11 and 12: Work 1 sc in each st around — 24 sts. Round 13: Work *2 sc in next st, 1 sc in each of the next 7 sts, rep from * around — 27 sts. Round 14: Work 1 sc in each st around — 27 sts. Remove stitch marker and Sl st in next 2 sts. Round 15: Ch 1, work *1 sc in each of the next 2 sts, 1 hdc in next, 2 dc in next, 1 hdc in next, 1 sc in next, 1 hdc in next, 2 dc in next, 1 hdc in next, rep from * around, join in first st of round — 33 sts. 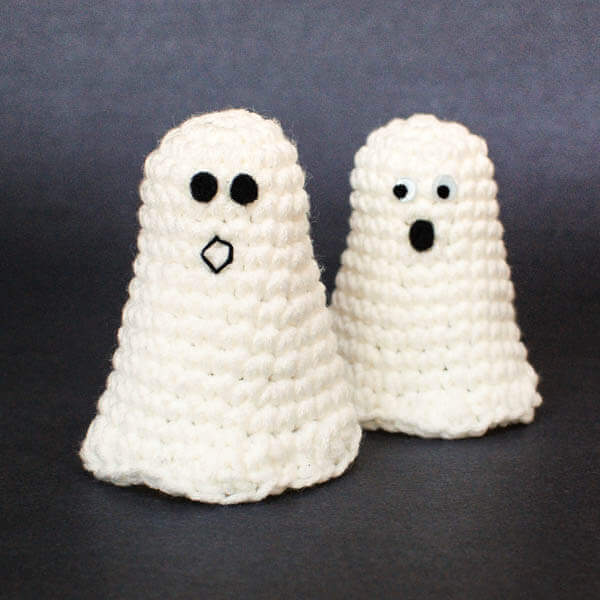 Finish off your ghosts with a scary or sweet face, using black crochet thread, cut felt, craft eyes, or a combination of these as I did here. 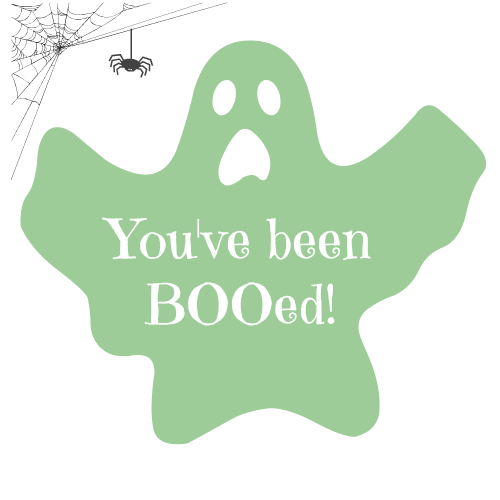 Click here to download this “You’ve been BOOed!” printable. A fun and easy project! I set my ghosts over a flameless tea light to give them a spooky glow. That’s such a great idea, Peggy! I don’t know how to crotchet but this is so cute! This would be a great finger puppet!